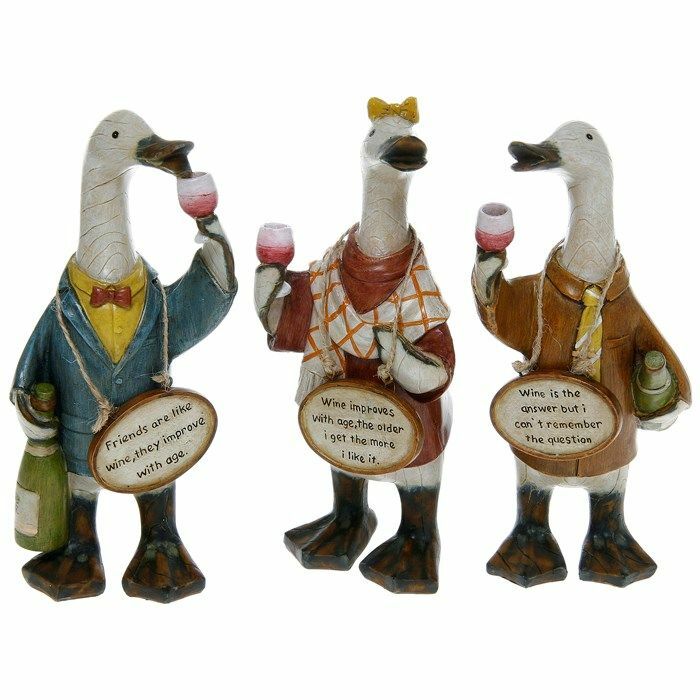 Novelty Wine Loving Ducks Set of 3: 1. In pink jacket with a sign saying "WINE IMPROVES WITH AGE, THE OLDER I GET THE MORE I LIKE IT". 2. Wearing a brown jacket and yellow tie, saying "WINE IS THE ANSWER BUT I CAN'T REMEMBER THE QUESTION". 3. In blue jacket and a pink bow tie with a sign saying "FRIENDS ARE LIKE WINE, THEY IMPROVE WITH AGE". A great gift item for any duck or wine lover. Approx Size 17 cm tall x 6 cm wide. Please take a look in our shop for other novelty and gift items. Lovely ornaments, best shown in groups. The Complete Collection of 3. Adorable gossiping wine-swilling ducks get the attention they deserve. Tongue in cheek humour that never goes out of fashion. Each duck has a funky but subtle co-ordinating colouring. Shabby Chic style. Look great grouped together, but individually boxed so, if gifting, they can be given separately.